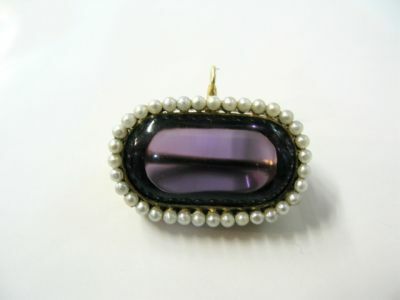 A beautiful Victorian 14 karat yellow gold pendant or brooch, with 1bezel-set medium violet/purple polished oval amethyst, est. 20.41ct. and 35 seed pearls that are approx. 2.0mm. each. It measures approx. 1 1/8 inches (2.86cm) x 3/4 inches (1.91cm).